The M.D. 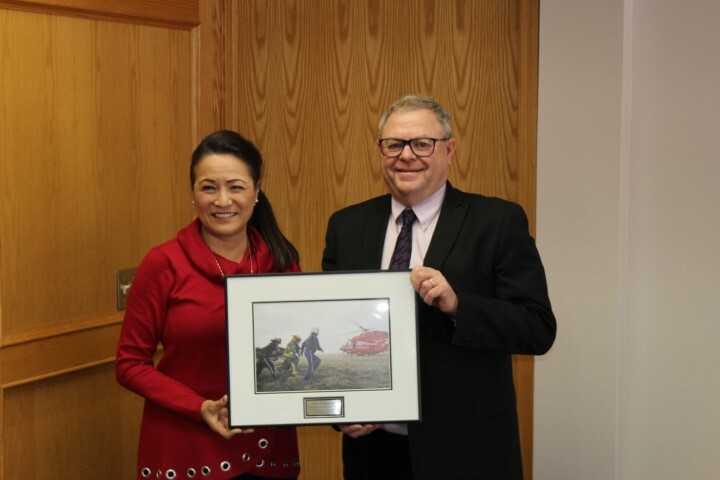 of Wainwright is situated in the heart of the agriculture and oil industries and is a major partner with one of Canada’s largest military training bases. This makes the M.D. of Wainwright an area of diverse wealth both socially and economically and allows us to provide our residents with many services and the benefit of low taxes. In addition, the M.D. of Wainwright offers various historical and recreational attractions for residents and visitors. The M.D. of Wainwright is a progressive community that is a great place to live, work and raise a family. We are glad to welcome you. In 2016 the M.D. of Wainwright had a population of 4,479 living in 1,459 of its 1,768 total private dwellings, a change of 8.2% from its 2011 population of 4,138. With a land area of 4,156.56 km2 (1,604.86 sq mi), it had a population density of 1.1/km2 (2.8/sq mi) in 2016. The M.D. of Wainwright No. 61 will be closed on Good Friday April 19, 2019 and Easter Monday April 22, 2019. We will be open regular hours again on Tuesday April 23, 2019. 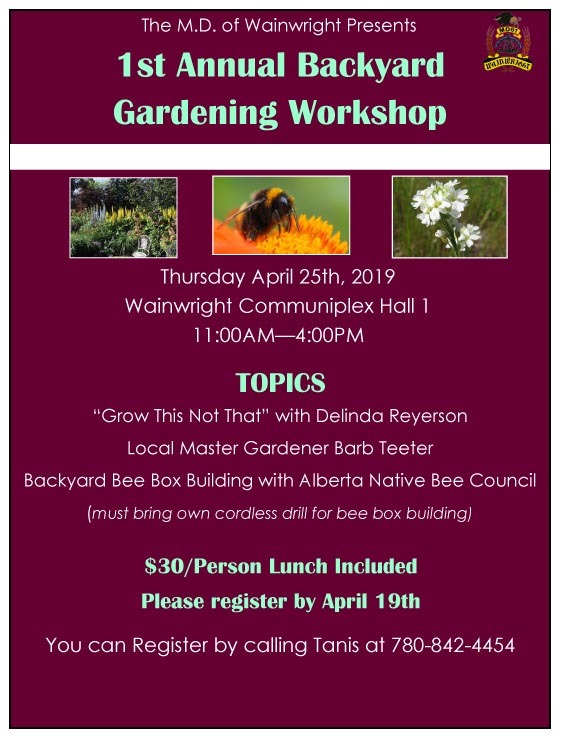 The Municipal District of Wainwright No. 61 invites prices for the repair of approximately 19,100 metres of road cracks. Interested contractors are invited to review the detailed project package for additional information. The package may be obtained at the M.D. office, 717 – 14th Avenue, Wainwright, Alberta during regular business hours. The M.D. of Wainwright reserves the right to waive informalities in, or reject any or all prices, or accept the price deemed most favorable in the interest of the M.D. The lowest or any price may not necessarily be accepted. Submissions marked “Road Crack Repair Proposal” will be accepted until 10:00 a.m. May 7, 2019 at the address indicated below. 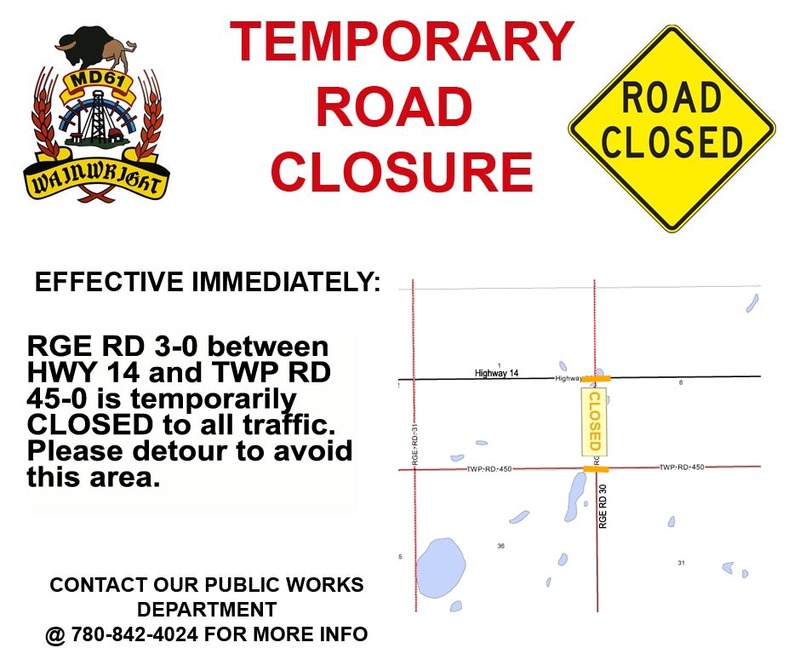 For additional information or questions please contact Mark Greibrok, Director of Road Construction at 780-842-0486. The deadline for the M.D. 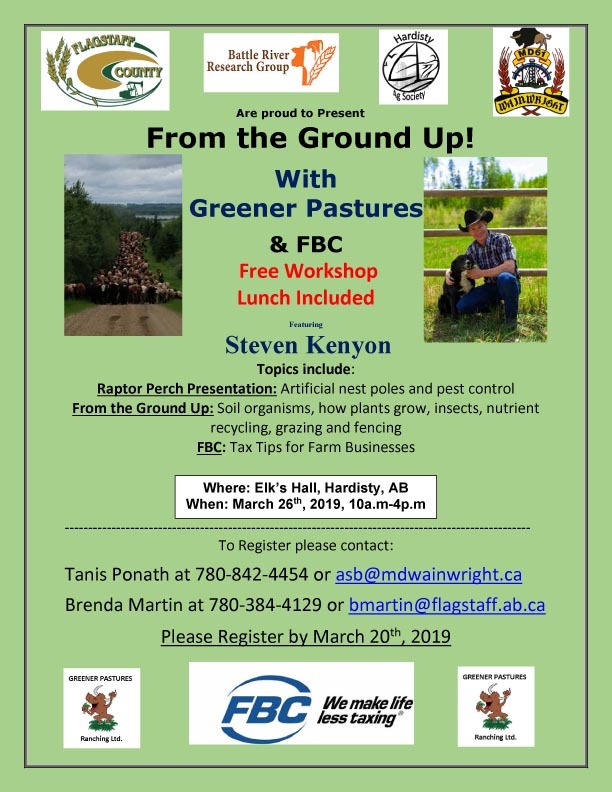 of Wainwright No Spray and Roadside Haying agreements is May 1st! If you are interested in participating in the program this year, please stop in at the M.D. office to fill out an application form. Forms are also available online here. 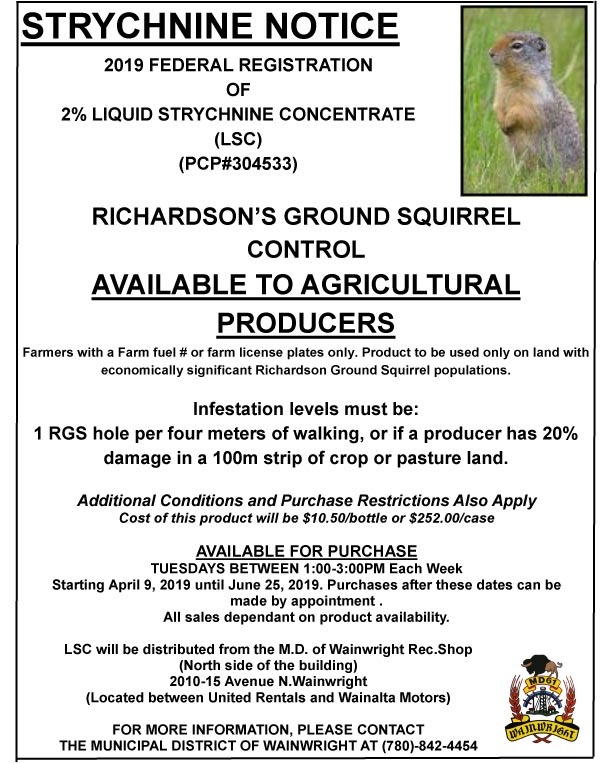 The roadside spray program will commence June 1st and rodside mowing will begin July 15th and will be completed by Auguest 31st. Council and staff will be in attendance. 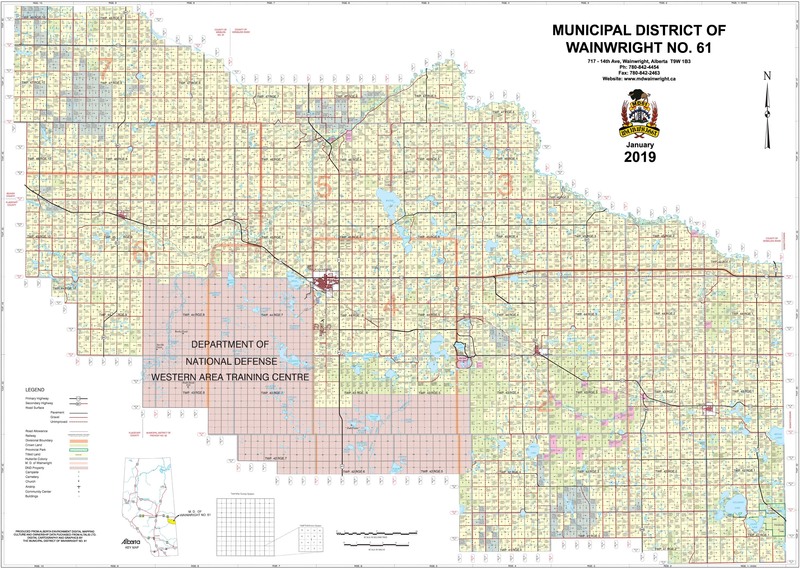 The Municipal District of Wainwright No. 61 invites prices for the supply of approximately 745 metric tonnes of MC 250 road oil product for 2019. Supplier(s) will be required to deliver product to the M.D. of Wainwright Public Works Yard in Wainwright, Alberta. 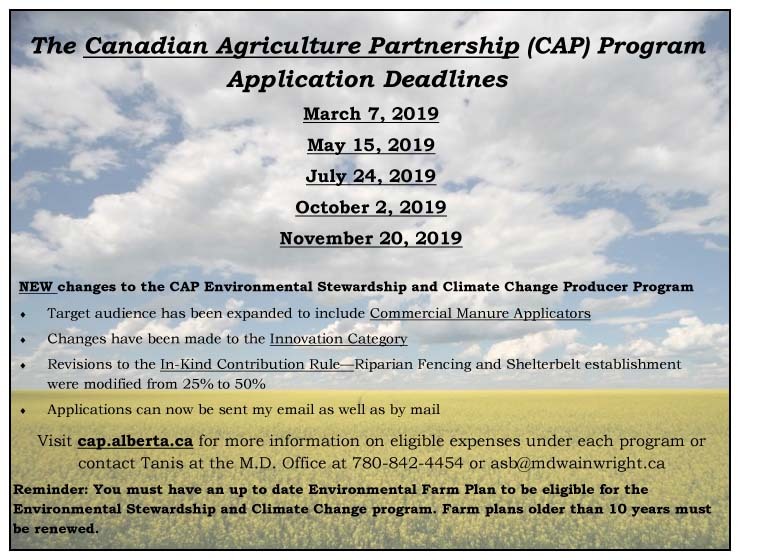 Please submit prices on the attached Schedule B.
Submissions marked “2019 Road Oil Supply” will be accepted until 10:00 a.m. April 11, 2019 at the address indicated below. The M.D. 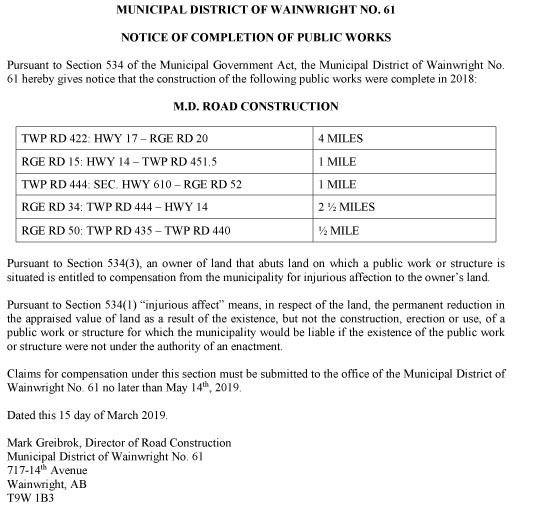 of Wainwright is inviting applications for seasonal Construction Operators and Labourers for the 2019 construction season. Qualified applicants must have a valid class 5 driver’s license and prior equipment operation experience would be an asset. Only those requested for an interview will be contacted. Glenda Farnden from STARS makes a presentation to Reeve Bob Barss of the M.D. 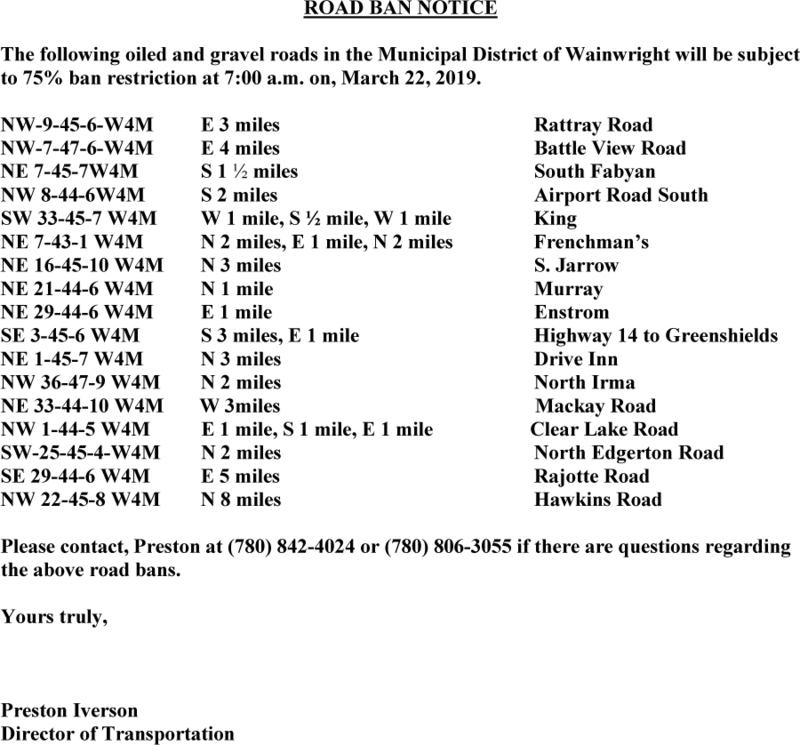 of Wainwright No. 61 in recognition of the M.D. 's funding commitment of $10,000 per year for four years. Please be advised that due to damage from and accident, the M.D. of Wainwright No. 61 has temporarily lowered the weight restriction on the old Fabyan Bridge located on Range Road 75 just north of Hwy 14. The bridge capacity is now a maximum of 15 tons. This change is effective immediately. The M.D. of Wainwright and Waste Management would like to remind everyone that the following items are unacceptable waste for front load bins.